The Northern Utah Division produces cars as fund-raisers. The Division has no dues (other than being a NMRA member) and by doing special limited-run cars (usually only 48) it helps raise money for our activities and events. The car chosen for the 2017 Northern Utah Division car is the Denver & Salt Lake refrigerator car. The Denver & Salt Lake had six of these, 60000-60005, built by Pullman in April 1913. They were steel underframe, wood body cars painted burnt orange for most of their working life then painted black toward the end. They were in service until 1947; there is no record of their disposition but were likely scrapped or sold by the D&RGW. We have chosen the orange color for our reefers (more colorful than black) and we are using the Accurail 4800 series 40′ wood refrigerator car, which is very close to the prototype. Thanks to Ken Shaver of the Denver & Salt Lake Historical Society giving us great input about the artwork and supplying a builders photograph, the lettering is exact. The 2016 Northern Utah Division car will be a Utah Poultry car. Daylight Orange sides, oxide ends and roof, MILK WHITE EGGS is white outlined in red, the rest of the lettering is black. While these cars were loaded in Utah with “MILK WHITE EGGS”, they traveled throughout the United States delivering these special eggs. The Utah Poultry Producers Association was formed in 1923 to improve the quality of eggs. The association was very successful, Utah’s “MILK WHITE EGGS” commanded the highest prices in the leading markets of the country. Most of the eggs were shipped to market (New York City was a major market) in Utah Poultry Producer refrigerator cars reproduced in HO scale by Accurail for the Northern Utah Division, NMRA. We have a photograph with numbers 6198, 6199, 6202 and 6205 and another showing at least nineteen Utah Poultry Producer cars (no numbers are readable). The Northern Utah Division car is numbered 6199 and renumbering decals will be available. We have a photo showing about twenty of these cars and another photo with four cars (the only two known photos). The second photo has readable car numbers for the four cars, so the renumbering decals will include these numbers and the rest will be “could-have-beens”. The 2015 Northern Utah Division Car is a Fisher Beer reefer fantasy car based on logos from an actual Fisher Beer bottle dating to the 1950s-1960s. An Accurail 8500 Series 40′ Steel Plug Door Refrigerator Car will be used. There will be only forty-eight cars produced. 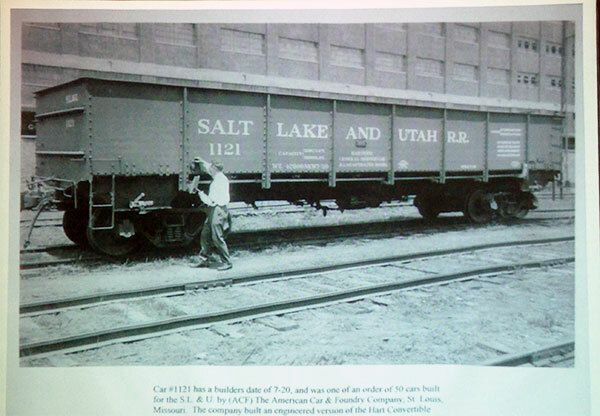 The green Saltair boxcar is based on the SLG&W Number 100′s early decoration with the large Saltair logo on the left side and no lettering on the right, the boxcar’s body color and lettering color are based on the Salt Lake, Garfield & Western passenger cars of the late 1940s into the early 1960s. This is an Accurail 4600 Series 40′ Double Sheath Wood Boxcar, the number 2014 represents the year of release by the Northern Utah Division, NMRA. The Tooele Valley Railway hopper lettering is based on the Tooele Valley Railway hopper number 105. The Accurail 2400 series USRA hopper uses the number 2014 for the year of release by the Northern Utah Division, NMRA. For the Golden Spike Limited 2014 the convention committee and the Northern Utah Division has approved two different cars, a Salt Lake, Garfield & Western boxcar (Saltair) and a Salt Lake & Utah gondola. A run of forty‐eight of each. 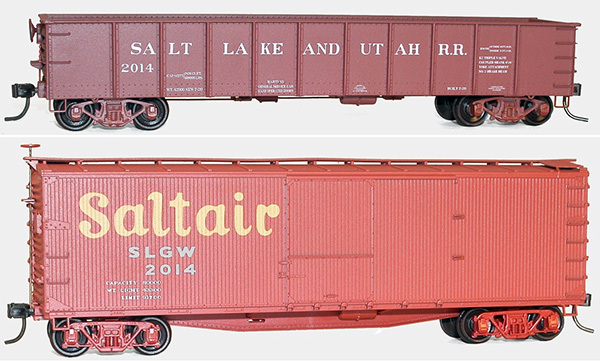 The Saltair car is based on the SLG&W Number 100’s early decoration with the large Saltair logo on the left side and no lettering on the right side but using the Accurail 4600 Series 40′ Double Sheath Wood Boxcars in mineral red. We will provide a convention decal or sticker for the purchaser to apply to the right side, if desired. The illustration is a model I built awhile back of the #100. The convention car will be very similar except for the body style and the number is 2014. The Salt Lake & Utah gondola is based on a photo of the SL&U #1121 but using an Accurail 3700 series gondola in mineral red and numbered 2014. SL&U gondolas were interchanged all over the United Stated making a SL&U gondola appropriate for any transition era layout. The long anticipated Wasatch Beers Polygamy Porter Accurail reefers are finally in process!! 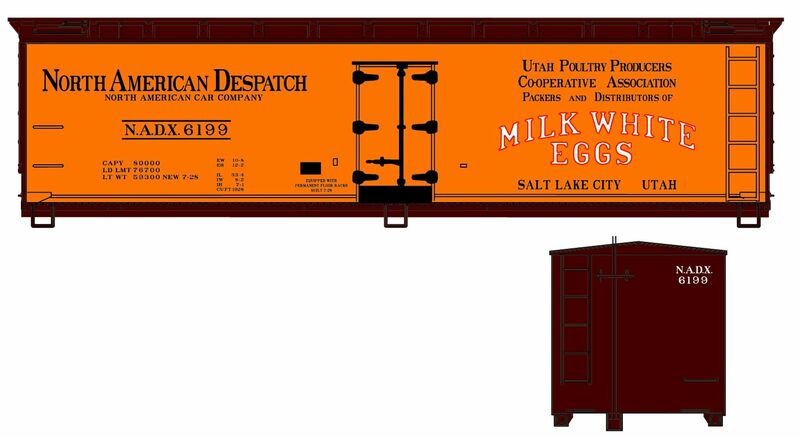 The Northern Utah Division has ordered forty‐eight custom Accurail HO scale wood‐sided reefer kits decorated for the well‐known, locally brewed Polygamy Porter beer. The car number 2013. The kits will be ready for distribution in September 2013. The cars are priced at $35.00 each if paid for on or before June 15, 2013, $40.00 after that date. For those out of the area, add $5.00 for shipping to anywhere in the US.